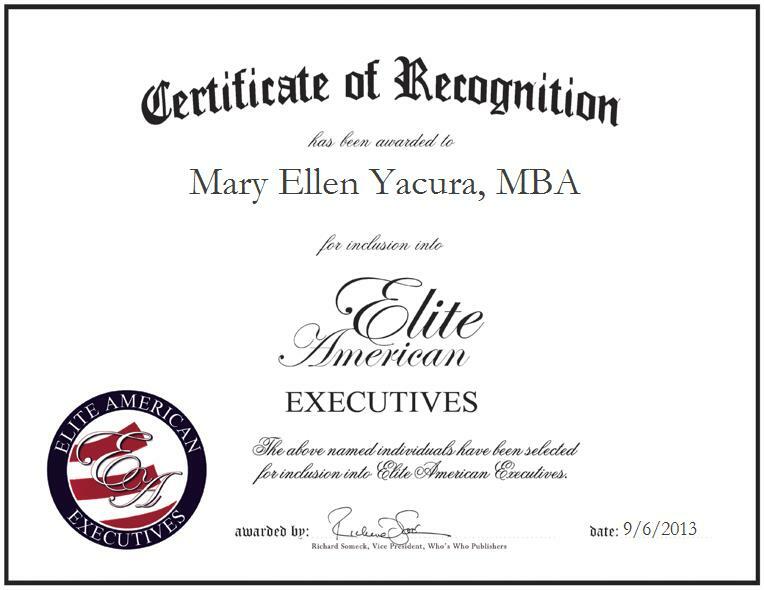 Company: Mercuria Energy Trading, Inc.
DARIEN, CT, September 6, 2013, Mary Ellen Yacura, MBA, Director of Structured and Trade Finance at Mercuria Energy Trading, Inc., has been recognized by Elite American Executives for dedication, achievements, and leadership in financial management. Specializing in structured trade finance, Ms. Yacura makes the most of her knowledge of financial management, and her years of experience, at her current executive leadership post with a renowned trading company, wherein she is responsible for making banking facilities and structured trade finance transactions. Ms. Yacura has spent more than 34 years building on an ever emergent skill set, which encompasses a sophisticated background in structured trade finance. Her talents have enabled her to achieve her professional goals and make a name for herself in her field, and she continues to strive for excellence in her every endeavor. Ms. Yacura earned a Master of Public and International Affairs, as well as a Master of Business Administration in Finance, both from the University of Pittsburgh. She has since remained abreast of trends and developments in her field as a member of the National Association of Credit Management, and the International Energy Credit Association, Inc. She is also a board member of the Orthopaedic Foundation for Active Lifestyles. The highlight of Ms. Yacura’s career was being the vice president of Trafigura and serving on the board of directors of the International Energy Credit Association, Inc. for three years.